One sunny Sunday morning in late August, I ventured out to Queens to meet Amnun Kimyagarov, the author of “Classic Central Asian (Bukharian) Jewish Cuisine and Customs.” (I learned about this book from a woman named Dahlia who I had interviewed for the Afghani/Bukharian chapter of my Passover cookbook.) Amnun’s phone number was right there in the book, so why not call? 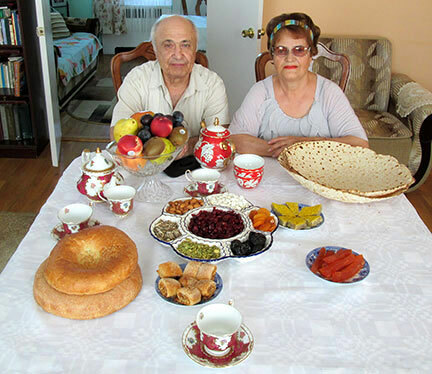 Amnun answered the phone and, after I introduced myself and told him about my Passover cookbook project, agreed to my coming to him for an interview about Bukharian Passover traditions and foods. As expected, the subway ride from the Upper West Side to Rego Park, Queens on a Sunday was a challenge, but I was prepared leaving plenty of time. (Something else I found very confusing was the layout of Queens: Is it 53rd Drive, 53rd Road, or 53rd Street? I definitely felt like I was in a foreign land!) But in the end I did make it to Amnun’s with even 15 minutes to spare, choosing to explore the main supermarket on Queens Boulevard with its interesting foods and packaged goods from Central Asia (and Russian radio blasting in the background). Upon arriving at Amnun’s I was greeted with a friendly smile by both Amnun and his wife Zoya. 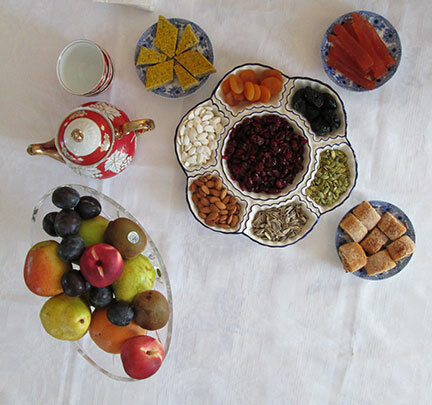 The table sitting right there in the middle of the living room was covered with a white tablecloth and arranged like a still life of fresh fruits and melon slices, round Central Asian breads, diamond-shaped walnut pastries, a platter of dried fruit, nuts, and green tea. It was so beautiful I had to take a photo before even sitting down. Zoya presented me with this large flat bread whose texture looked just like a matzah, but in the form of a shallow wok or bowl. They told me that it was a special Bukharian cracker-like bread called Noni Toqiy that was baked in a traditional clay oven called a tandyr, the same kind of oven that was used for baking matzah (what they called maso) during Passover. Even though this bread was not technically the matzah used for Passover (it was August after all! ), they told me that it very much looked like the Bukharian maso. I was fascinated to imagine how their matzah would look so different from the store-bought ones that I knew growing up that were always square, totally flat, and half the size. 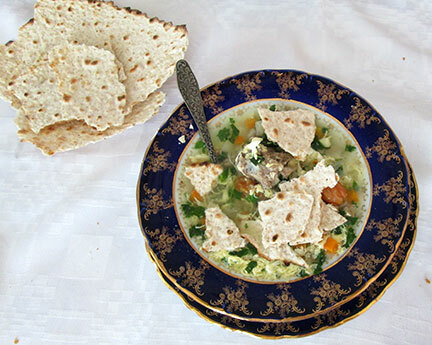 In addition to the matzah, Zoya was generous with her time by showing me how to make Oshi Masozgoshak, a matzah-egg soup with cilantro, chopped veal, and dried yellow plums. Traditionally the soup would use special green apricots that were available in Central Asia during the spring time. They were hard, and green, and very tart because they were not yet ripe, but when added to the soup became soft and imparted a special flavor. Because these green apricots were not something that could be found in Queens (much less in the U.S.), they instead substituted a dried yellow plum in its place, which also has a distinct sourness to it. These yellow plums are also known as golden plums and come from Central Asia. With the scrambled egg mixed into the chicken broth, it reminded me of the common Chinese egg drop soup, and made me wonder if this was one of the Asian influences on Bukharian cooking? The addition of the matzah made it Jewish and for Passover, and the sour plums/apricots felt Middle or Near Eastern. Upon leaving I was given one of the round breads and the remaining matzah pieces to take home, and Amnun and Zoya hospitably walked me to the supermarket right near the subway, where i shopped for yogurt, pirogis, and these unusual dried yellow plums. 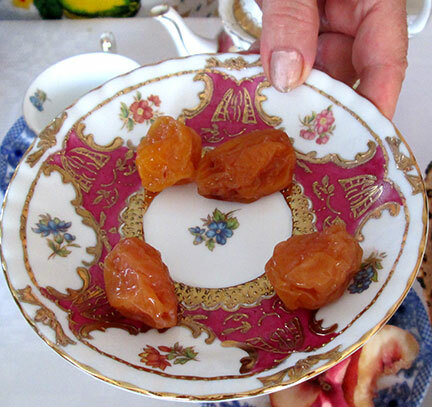 What I ended up finding was something called Apricot Kondak from Uzbekistan, which looked similar to the dried golden plums that Zoya had put into the soup. Perhaps these were the same apricot that they mentioned using fresh and green in Uzbekistan? I will have to ask. 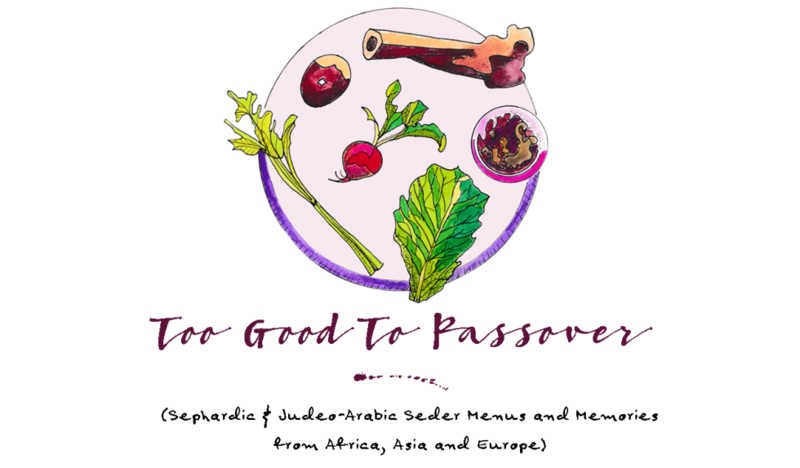 Overall it was a very successful day, and reminded me why I was writing this blog and my Passover cookbook to begin with.